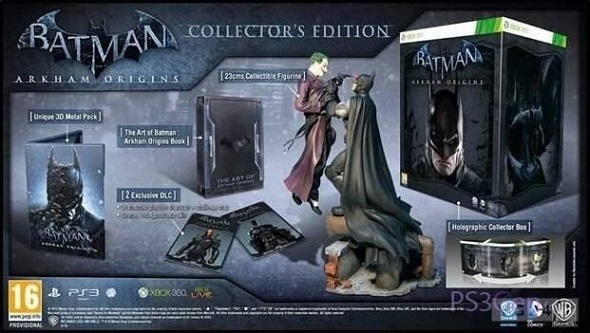 Batman: Arkham Origins game will receive a collector's edition! We haven’t heard anything new from the developers of the famous game series about Batman superhero for a long time, but finally there is new information about Batman: Arkham Origins. So, according to many sites, where a new information about Batman: Arkham Origins game has appeared almost simultaneously, this action-adventure will receive soon its exclusive collector's edition. After these retailers, Batman: Arkham Origins collector's edition will contain 23cm statue depicting two eternal enemies - Batman and Joker, exclusive 3D steelbook, The Art of Batman: Arkham Origins Book, two special DLCs, and a holographic box in which all these nice bonuses will be placed. Although the exact cost of the edition is still unknown, but relying on European online stores’ information, its approximate price is €99 and it will be offered only to PS3 and Xbox 360 owners. Take advantage of this attractive offer and buy Batman: Arkham Origins collector's edition or not - it’s your decision. And we, in our turn, hasten to remind you that Batman: Arkham Origins game will be finished on the 25th of October for PC, Wii U, PS3, PS4 and Xbox 360.